Short on Time? Short on Gift Ideas? 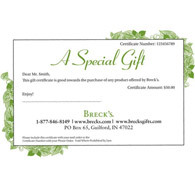 Gift certificates are mailed to the recipient and will be received with into 5-7 business days. E-certificates are sent out via emailed to a recipient and will be received shortly after placing the order. Please Note: You will receive Order Confirmation and Shipping Confirmation emails when your E-Gift Certificate order is received. However, the confirmation messages may suggest that your gift will be shipped to your billing address. Not to worry--we will only send your E-Gift Certificate to the email address provided. 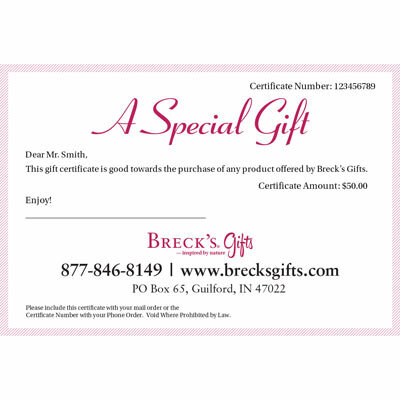 Gift Certificates and E-Certificates can be applied to Breck's Gifts website by phone or mail. At checkout, enter the gift certificate or egift certificate number on the payment page. Simply provide the gift certificate or eGift certificate number at payment. The certificate's value will be applied to your purchase.